There is also a white board above FL’s head. Today it said: “Bed Bound, Poor Swallow” and I immediately thought of him as an injured bird, grounded by a broken wing. FL was miserable today. When I arrived, the doctor was keen to engage me at his bedside, trying to get to the bottom of his refusal to take any drugs last night and again this morning. The doctor tried. I tried. He did not respond, other than the faintest shake of his head. The doctor looked at me, but spoke as if she was speaking to him: just press the buzzer if you want pain relief. I attempted to talk to him, just to say good morning really, but he hardly opened his eyes. He indicated that he wanted some water, had a sip, then fell asleep. And so the hours wore on in silence. Every so often he would signal for water and then subside again. In the late morning he spoke for the first time: “I wet the bed”. So I buzzed for the nurses and escaped for a coffee in the conservatory. There, the resident writer introduced me to the resident artist: “No obligation! But I saw you were knitting and thought you might be a creative type!” So we talked about spinning and his family’s weaving heritage on the Isle of Lewis, until I was called back to the bedside. And the day crept on. It came to be time for me to leave, so I packed up my knitting and my book, and put on my coat. I offered him some water. He began to make frantic signals which I did not understand until I realised he was about to be sick. Fortunately a nurse was just passing the door and we got him into a sitting position before he choked. She offered him an anti-sickness drug. He has had it before, when the same thing happened in the night. I told him that he needed to take his medicine, that not taking it would not make it all be over any sooner, it would just make it more unpleasant: You do not need to be in pain! You do not need to be sick! The nurse left us alone for a minute. I explained to him that if he was not able to make the decision for himself, I would do it for him, that all anyone wants is for him to be comfortable. I replied that they know an awful lot about how to reduce physical pain and that if he accepts their help, he could be made comfortable. But that if he doesn’t take his pain relief he will be in distress and there is no need for it! Physical pain can be treated! Ha! We both know that his greatest pain right now is emotional. He is hurting deep inside. I cannot make it better, however hard I try. When the nurse returned, he did not agree or disagree with the proposal that he have an anti-sickness injection. She took the opportunity to install a syringe driver, so that he can receive pain relief in the same way. She said she would be back in 20 minutes to change his position in bed. And so I took my leave. I did a silly dance to the door. Night night! No nonsenses! See you in the morning! Exactly what I used to say the kids when they were small. 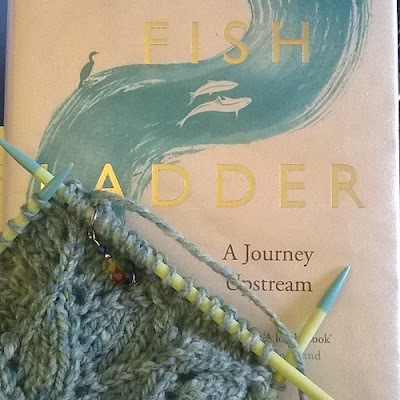 Today I knitted a Vivid Square and began reading a beautifully-written book: The Fish Ladder by Katharine Norbury.